I have lived to see my worst nightmares come true. No, not true... you and Lara still live, and there is still hope. Today is the day we met with the leonin to sign the treaty, to pledge a truce between our people and those ferocious beast-men who have plagued and assaulted us for so long. Today is the day that the kingdom of Iretis has come to the precipice of destruction. We met near the height of the sun, at a pavilion set up by both sides, far away from both our city and the leonin tribal areas. Udaen had spent many weeks negotiating the specifics of how many troops each side were allowed to bring, and how the ceremony would progress. Udaen and I were at the table, along with two of my bodyguard, Chelta and Vanin. There were six leonin tribal elders with us, although their only obvious sign of age were their number of scars. They were warriors all, and they looked at the bodyguards with disdain. It is one thing to fight cats in the heat of battle, but to be up close to these feral animals was unnerving. Taller, bigger, thicker than the mightiest of men, with claws that could slice a man from throat to stomach, and sharp teeth as large as a finger. Their stench was difficult to bear in the close confines around the signing table. Truly, I thought at the time, there are few creatures as fearsome as these. If only I could go back to that time today and know how blessed my ignorance was. There was no ominous wind, no dark heralding, no premonition like the stories would have you believe—in a single moment, we went from crafting a peace to living in war. In a single moment, there were nightmares among us. A tall human figure encased completely in metal, everywhere on his body were spikes and sharp edges. His metallic form moved fluidly and easily as he swung his fist at one of the leonin, and the cat's head exploded in blood and bone. Another man was swathed in a greenish mist, and dripping from his hands and tongue were long drops of honey. He leaned in close to a leonin and blew out that honeyed, poisoned mist. The cat died, choking and gasping for air, as the sweet mist closed in. The cats weren't the only ones slaughtered. In front of me, Thoros's two-headed monstrosity of a cat appeared, four arms and all, like a child's nightmare of a cat come to life. I had a moment to think of how I had killed Thoros because I did not believe him, before the beast roared in front of me and raised its arms. Chelta bulled me out of the way and stabbed at the monster's chest. The sword penetrated, but the monster took no notice as it clawed at Chelta's head with two of its massive arms. Chelta's head stayed on but most of his face was gone as he dropped to the ground dead. He never even screamed. The monster then left the pavilion to seek out other humans, Chelta's sword still sticking through his body. Behind me I heard a growl, and turned to look at an inky cloud of darkness, roughly man-height, floating a few inches off of the ground, with a pair of golden glowing cat-eyes blinking from within the cloud. Vanin whirled to face this new threat. Udaen shouted at us both to flee, but Vanin charged the cloud, hoping perhaps to find something to kill within. A clawed hand came out of the darkness and grabbed Vanin's shoulder and dragged him into the cloud, where Vanin's screams and the sound of something eating and chewing could be heard. Nothing left the cloud, not even Vanin's remains. Those horrible golden eyes blinked once at me, and then the cloud moved in the opposite direction, killing and enveloping the humans, my soldiers, outside of the pavilion. Even as I write down every detail, seeking to capture every improbability, I can hardly believe what I saw. But I did see them. These were our worst dreams come to life to slaughter us. Udaen and I looked at each other in horror, at how quickly all we had worked toward vanished in blood and violence. While I was still in shock, I was still a warrior, a king. I reached down to Chelta's body and grabbed one of his spears, hoping to fight against the monsters. But what the monsters had begun, cat and human were too willing to finish. Of the nightmares there was no sign, but everywhere were humans and cats slaughtering each other. Each side assumed the other had sought to betray. I stood there, rooted to the ground, my prayers to the gods unspoken, my mind refusing to work, refusing to decide. I was witnessing the death of almost everything I hold dear. 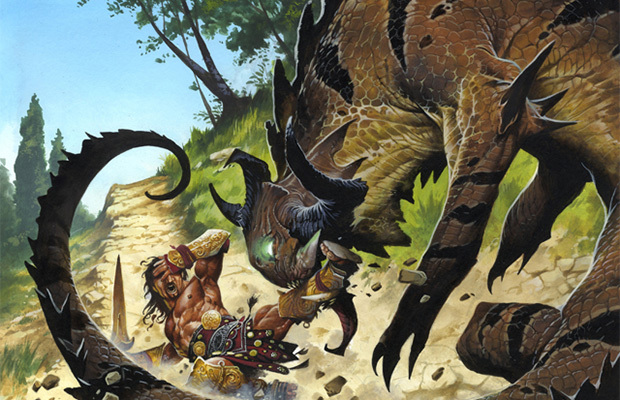 With a scream I hurled a spear at a cat, one of the few leonin elders who had not fallen prey to the nightmares. He fell prey to me instead. Within minutes the battle was done, and we were the only ones left standing as a few cat stragglers made their escape. We were in no shape to pursue and finish the slaughter. Out of my original force, only twelve men, including Udaen and me, remained. Udaen had managed to hide under the table, and blessedly escaped death. I don't know why we were able to prevail so easily, given how even our numbers were at the start. Maybe the nightmares killed more of the cats before they vanished. Surely this must have been the work of some god. Mogis, or perhaps Phenax. But I have been a devout king, and have said my prayers and made my offerings to Heliod and Ephara and Iroas. Udaen thinks some other malevolent force to blame, but admits he cannot say who. Regardless of who is to blame, Iretis is facing its darkest days. Udaen says he has received reports that the leonin tribes in the greater surrounding areas are already gathering and marching for war. Their reported numbers are in the many thousands, far more than my beleaguered army, especially without the expansionist forces. The cats' goal is likely the destruction of Iretis and its people. My people. And now I sit here in my throne room and write, as I have done for the last two hours. 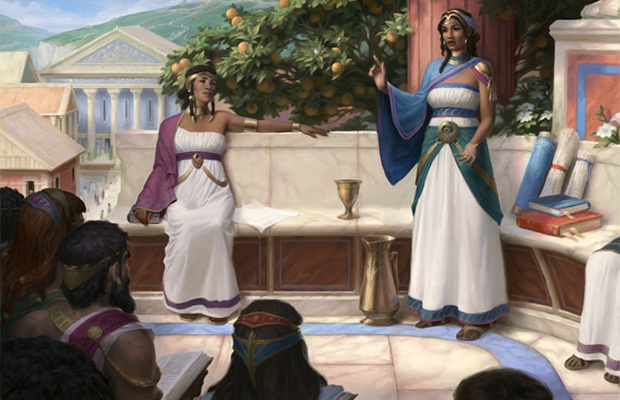 I have written letters to Meletis, and Akros, and Setessa, pleading for assistance. I have written letters to the other leonin tribes, for whatever good that might do. And I am writing this letter to you, Klytessa, my last letter of the evening. I know you were leaving from Meletis in a few days time, but now you must stay there until this storm has passed. Add your voice to mine before the Twelve. While Iretis has always been jealous of Meletis, surely Meletis will not let its tiny cousin perish from the earth. I love you. The world is a dark and terrible place, but I will meet it with light and courage and hope. Though nothing makes sense to me today, I still have light. This flickering torch light above me, illuminating these words to you. I still have courage. The thumping in my chest as I continue to strive for Iretis's survival. And I still have hope. These words to you are the proof of that. We will see each other soon, in happiness. A topic of frequent debate in these hallowed halls is a beguiling simple question—what is the nature of reality? How can we be sure that what our eyes, what our very senses are telling us, is in fact, a shared truth? Even if multiple people see the same thing, what if they are merely subject to the same delusion? Some of us believe that the material world is an essential truth, and we can only distort that essential truth through our flawed lenses of perception. Others of us believe that we help create the world through our very act of perception. Of course, taken to an extreme, this view would lead to the ludicrous notion of... but we digress. None of this is directly relevant to your request for assistance. Your letter sponsored a fresh round of argument on the nature of reality, which was lively and contentious, but we all agreed to deny your request. What is beyond dispute is that your men, under your command, have slaughtered hundreds of leonin under the auspices of a peace treaty. We commissioned oracular study of the events you described, and found no evidence of these "monsters" you claim initiated the slaughter. Nor do your descriptions of these creatures match the knowledge we have of divine visitations. Either you are lying, or you are insane, or you face a new and terrifying threat. This in itself is a fascinating question, and one we spent some amount of time debating. We have more debates on the topic scheduled this afternoon, but regardless of the conclusion, none of these outcomes give us any reason to lend you support. We have formally declared our support for the leonin mission to overthrow you and end your tyranny. As of this moment, all diplomatic ties between Meletis and Iretis are severed, until your reign has ended. When you were four years old, you refused to stay in your bed during the night. You would get up, walk past your sleeping nanny, and blink your large eyes at the guard, who would inevitably let you into our room. After a week of this I decided it was enough, and I told you to go back to your room. You refused, and I shouted, "Go back to your bed!" You looked up at me, and you blinked those now-even-larger eyes, and you said, "But my bed doesn't have daddy and mommy in it." I let you go back to sleep in our bed without another word, and you proceeded to sleep there for another few weeks until you declared, "I want my own bed," and you went back to your room and we never had a nighttime visit again. I think about that night often, Lara, and how you looked in that moment. I cherish that memory... I cherish all the memories I have of you. I love you very much. I have enclosed a letter to Lara in this letter to you. Please read it to her, and tell her how much I love her. There is a large army of leonin camped outside of the city's walls. Our earlier reports were correct, they number in the thousands. 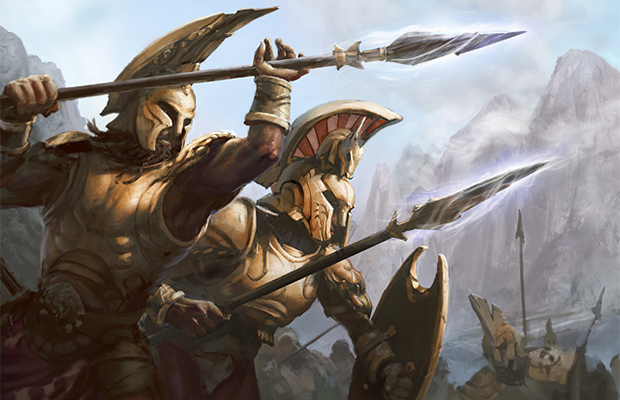 Meletis and Akros and Setessa have all refused our requests for aid. They claim I am crazy or worse. When everyone thinks you crazy, it can drive you insane. Udaen claims that there is still hope, that there is still the possibility of having the leonin stand down and return to their lands. I appreciate his efforts, but it does not matter. If I could kill myself here, if I could know that doing so would save my people and my kingdom, I would do it. But I worry that the leonin would feel robbed of vengeance, robbed of justice. And in the leonin sating their need for blood, the cost to our people would be terrible. So soon I will leave my throne room, leave my palace, leave the city walls, and present myself to the leonin. The guards, my men, will not stop me. They can barely look at me now, their eyes drop to the ground when I pass. The ten men who returned with me are still loyal, but all of us carry the stink of failure and death. No, no one will stop me. My source of strength in this, as always, is you and Lara. Knowing the two of you are safe keeps me calm. I wish I could have had one more day of holding you, touching you, seeing your beautiful face. If I think on it any more, I will lose what resolve I have. I have had my life. It has been a good life. Perhaps Iretis will be able to recover from this disaster. Perhaps my sacrifice will allow a new rebirth for our kingdom. Perhaps one day people will understand all I did was for a lasting peace. Perhaps one day that peace will occur. My enduring legacy, my true legacy, are you and our daughter. There is knocking at the door. I hope it is Udaen with news. Phenax stood in the Iretian throne room, still invisible, looking down at the body of the king. Phenax had existed for a very long time, and had seen and done many things both wondrous and terrible in that span of years. Until today, he had never seen a mortal stab both of his own eyes out. When the old man had entered the room and told the king of the murder of his wife and child at the hands of the leonin, the king had screamed. Phenax had heard tortured screams as anguished as the mortal's, but it was still a scream of a special timbre, the sound of utter despair with no possibility of succor or redemption. A rare flavor. The mortal had then drawn his dagger and plunged it into his eye. It was the second stab into his other eye, the mortal shrieking all the while, that Phenax found so impressive. Phenax looked at the old man, still standing there, and the old man's form began to waver and shimmer. It slowly disappeared, and in the place of the illusion of the old man was another strange sight, although one Phenax had seen once before. The revealed form was humanoid and mortal. Of that Phenax was sure. 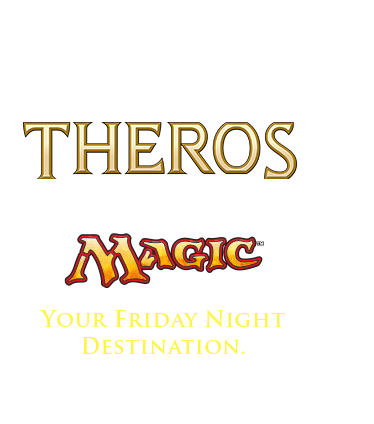 The form floated several inches from the ground and was dressed in black cloth and leather in a mockery of current fashions in the cities of Theros. Ignoring the head, the hands were the most interesting feature—exquisitely long, slender fingers with even longer talon-like claws for fingernails. The closest Phenax had seen to hands like these were those of a siren, those winged humanoid seducers that Phenax had a special fondness for. But the form in front of him was not a siren. The form in front of him shouldn't even be able to exist. The bottom half of the form's head was normal—human, even. But the top half was impossible. Two large black horns, made of some rough rocky substance, framed...nothing. No upper face, no head, no eyes or nose. Nothing except wispy black smoke continuously emanating from where the figure's mouth and upper lip ended. The black smoke whirled around the figure's head, swirling down in wider radius outside the body. When the two had first met, the figure had called itself Ashiok. Ashiok floated over to the king's body, and saw the two letters the king had been writing. He, no, Phenax was not sure if the mortal even had a gender, Ashiok, bent down as if to read the letters, although Phenax did not know how a mortal could read without eyes. Ashiok stopped reading, picked up the letters, and brought them to the fireplace in the room. Ashiok held the letters above the fire for a second, then stopped and brought them back, undamaged, to lay on the desk. Ashiok smiled and a shudder passed through Ashiok's body. A few tiny pieces of Ashiok's cheek, so small they were discernible only to a god's senses, evaporated into wispy black smoke and joined the penumbra surrounding Ashiok. Phenax became visible, and his voice rumbled in the room, "The wife and child, you had them killed?" Most mortals would have been driven to their knees from the power of the god's voice. Ashiok merely hovered, and turned to face the god. "No. Yes. Perhaps. The story of their deaths I made up. But if they're not dead now, they easily could be soon. They were on their way from Meletis to here, that part was true. And the current traveling conditions are," another smile, "difficult. My dear Phenax, do you actually care?" Phenax was surprised to realize that he was in fact curious. He was appreciative of Ashiok's trick, but still this familiarity would not serve. "One warning only, Mortal. I care not for our deal nor for your abilities. Presume with me again, and I will erase you from existence." Phenax raised his voice at the end, and this time Ashiok floated back, head bowed in subservience, as was proper. "My apology if I offended. I had not anticipated your question, and I am not used to being caught unaware. I assume my delivery of the terms of our deal was satisfactory?" Ashiok's words were silky and smooth and precise, without being overly unctuous. It was the mark of a good deceiver, as Phenax knew well. But Phenax was very satisfied. He wanted a third city for the Returned, part of longer-term plans. He needed a minor city-state, not too powerful or notable, nor under the protection of one of his kind. And he needed to not have a direct hand in the city's downfall, so that none of his brethren could accuse him of undue influence. "I assume there will be no Iretian rebirth?" Ashiok laughed. "The leonin sacking of the city has already begun. Their bloodlust is large and will not be satiated for some time. I doubt there will be a living citizen of Iretis by tomorrow. The leonin may occupy the city for a short while, but they won't want to stay. They'll go back to their hills and plains. I will leave a few of my creations here to deal with any stragglers or brave adventurers. The major cities want no part of this debacle. No, Iretis is now yours, to do with as you will." "And you? 'Ask me what I want when I have completed your task.' Those were your words that ended our first meeting. You have completed your task, and you have completed it well, Mortal. I am satisfied. So what boon do you wish of me?" Ashiok again shuddered, and a few more specks of cheek vanished into smoke. "I have so much of what I want, Phenax. Theros is such a wonderful world, full of possibility. For so long I have sought to perfect my craft, pulling nightmares from the minds of dreamers and making them real. But here, here I can make more... ambitious nightmares come to life. Why be satisfied with simple creations that take bodily form, when I can take a man's darkest fears, the very ruin of his hopes and life's work, and turn the destruction of all he holds dear into a living nightmare? I have built a beautiful dream here in Iretis." Ashiok floated over to the dead king's body and bent down. Ashiok trailed one clawed finger up and down the length of the body's frame, before resting a finger on the hilt of the dagger plunged into the ruined eye. "I am pleased with my work today... but I have more beautiful art to achieve." Ashiok rose and floated back to Phenax. "What do I want? Let me tell you." As Ashiok leaned close and whispered, Phenax almost resolved to end the mortal regardless of the services delivered, but intrigued, he restrained himself. He heard Ashiok's request. And for the second time that day, Phenax was surprised. "You are sure, mortal? This is what you want?" "Look at me, god. Look at me truly. What do you see?" And Phenax, god of deception and lies, peered deep into Ashiok, into the essence of Ashiok's mortal being. Phenax laughed. A long, loud laugh that echoed down the halls, through the palace, and even out to the city beyond. Snarling leonin and the few humans that were left heard the laughter, and for a brief moment the bloodshed stopped, as every mortal paused before that horrible laugh. Phenax had not laughed like that in such a long time. 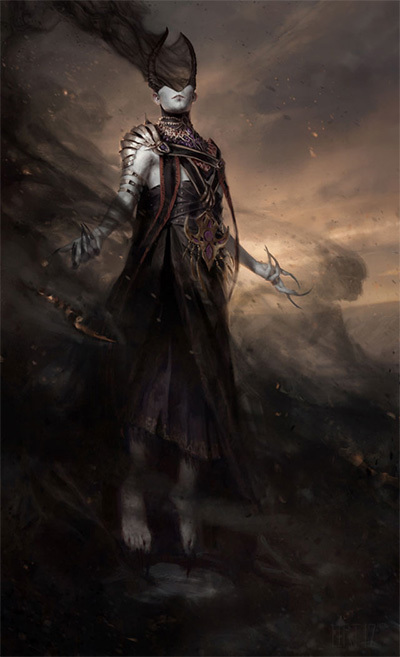 Ashiok had so many grand tricks. "So be it, mortal. You shall have your wish." And Phenax left Ashiok and the dead body of the ruined king in the former throne room of Iretis, his laughter echoing off the walls as he vanished.